Hi again, finally. I don't know if you have noticed that I don't post very often. I have noticed! I don't like it. I really want to be here sharing with you more often. Last week I was visiting family in Northern California. I really wanted to be there with them and enjoyed every minute of the visit. I had a great time playing ice cream shop and going on walks with my grandchildren. I miss them. Back to "the blog". I need a laptop. When I get a laptop, I'll be able to post from wherever I am. Can't wait for the lap top. What kind should I get? Is there one that works especially well for blogging type needs. I'll be looking for your input. This is an interactive blog you know. So you've been looking at the card above. I created that one for my 9 year old birthday girl (grandaughter). I used a retired stamp set but I don't remember what it is called. If you know, please let us all know. Remember this is an interactive blog. The card stock for the card base is Certainly Celery ( $6.95 for 8 1/2 x 11 on page 167) and the secondary layer is Lavendar Lace (retired). 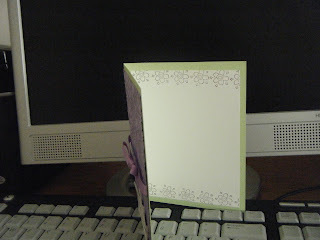 I used the Big Shot (page 204; only $99.95) and the textured impressions folder "Elegant Lines" (page 214; only $7.95). The lavendar grograin ribbon is retired. 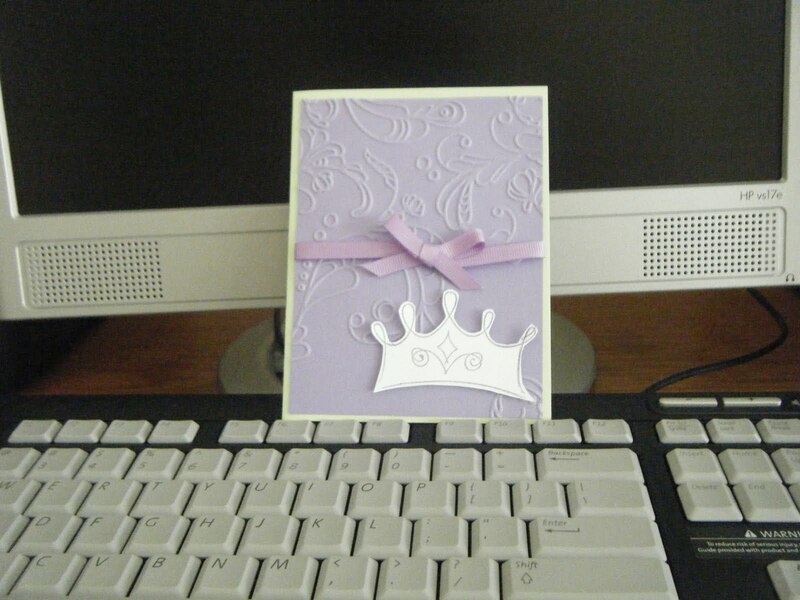 Do you like the card? What would you do differently? Did I tell you this is an interactive blog.? Onto looking at the inside of this card. 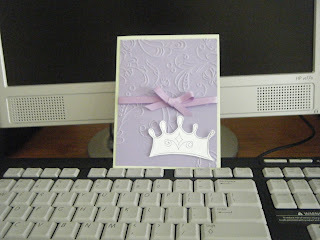 I used a single stamp with Lavendar Lace ink to adorn the top and bottom of the card. I think it adds a lil' something to the card.